The Cute Face of Evil. 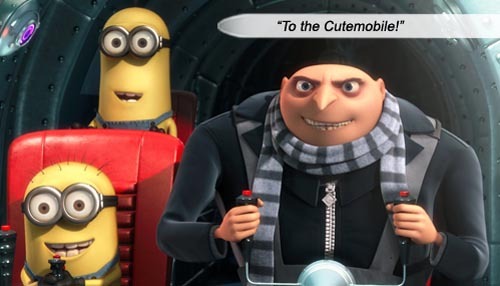 Supercute, superfluffy and superevil, the CGI cartoon DESPICABLE ME follows ambiguously-continental, flamboyant do-badder Gru (Steve Carell, outdoing himself with the half-Transylvanian, half-Albanian accent) in his quest to be the Greatest Supervillain in the World. The theft of the Great Pyramid by New Villain on the Block, Vector (voiced by Jason Segel) spurs Gru to strive for even greater glory – with his evil scientist Dr. Nefario (Russell Brand) and his army of Minions (hundreds of maddeningly cute diminutive yellow beings dressed in overalls and goggles, one of them voiced by Jemaine Clement of FLIGHT OF THE CONCHORDS), Gru plots to steal the Moon itself. No matter the cool jazz feel of the hip hop title song by Pharrell Williams (“I’m having a bad, bad day / If you take it personal, that’s okay / Watch, this is so fun to see / Uh, despicable me!”); no matter how cute the little girls are (“He’s so fluffy, I’m gonna die!”), and no matter the excellent writing in avoiding maudlinism in the unavoidable character arc of Gru becoming a loving surrogate father, the Minions sell this film, with their chattery language and peripheral sight gags, constantly doing something so despicably cute you just want to slap somebody. Writers: Ken Daurio, Sergio Pablos, Cinco Paul. Starring: Steve Carell, Russell Brand, Jason Segel, Julie Andrews, Will Arnett, Kristen Wiig, Miranda Cosgrove, Dana Gaier, Elsie Fisher, Pierre Coffin, Chris Renaud, Jemaine Clement, Jack McBrayer, Danny McBride.